Stratus Building Solutions is a unique franchising company offering multiple levels of investment opportunities to fit the needs of different entrepreneurs. 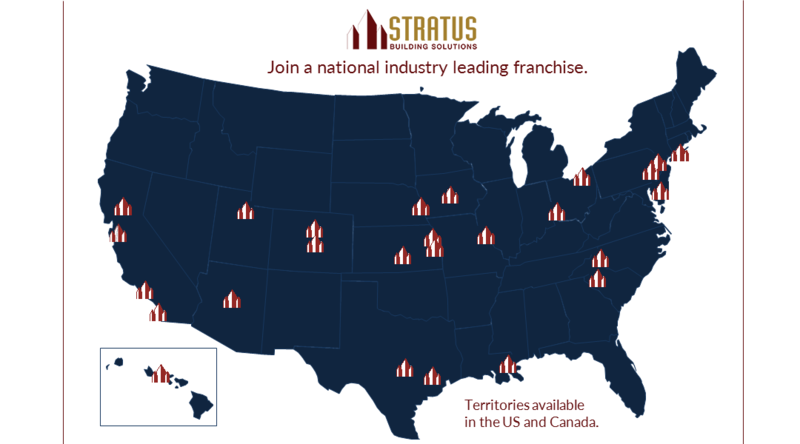 Our single-unit franchise opportunities operate as Stratus local cleaning experts providing services to janitorial franchise customers, where our area-developer or master franchsies operate as the sales and support centers for our single-unit franchsies. Referencing the map above, we are currently offering Commercial Cleaning and Janitorial unit franchsies in our existing locations. We are located across 27 locations in 17 states nationwide. If you are interested in leaning more about these franchise opportunieies and their benefits, please visit our Unit Franchise informational page and contact your closest regional office. If you are considering our area-developer, Master Franchise opportunity. Please visit our Master Franchise page for more information. Many franchise territories and major metropolitan areas available across the United States and Canada. If you are interested in learning more or would like to check availability of a territoriy, please contact our Corporate Office. Please feel free to contact with any further questions!